It gets more dreadful with age: Here's something you don't see every day: a Diamond Kings card featuring a player without a hat or a smile. 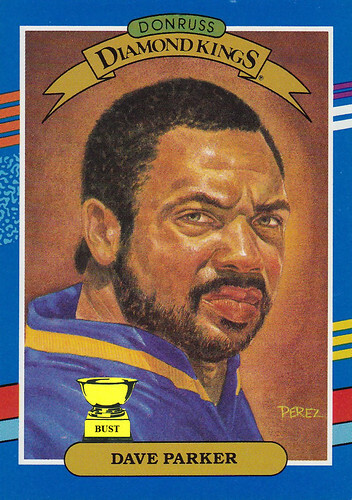 It's puzzling that Donruss and the artist, Mr. Perez, would do something special for Dave Parker. He was about 6 feet 10 and 52 years old in 1991, sure. But he was in his prime in the 1970s, so singling him out in a 1991 set seems odd. But maybe it's not his on-the-field exploits that led Donruss executives to bestow such an honor on "The Cobra." Maybe it was that awesome nickname. Maybe it was his steely stare or weathered skin. Or it could be his enviable beard or rarely seen black dude mullet. Look at that filthy mess back there. On second thought, maybe this Diamond Kings designation was well-deserved. Maybe we should save our venom and shelve our contempt for "The Cobra." Or maybe this card just bites.